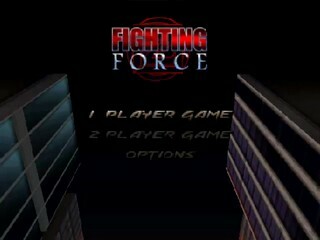 Released on the PS1, PC and N64, Fighting Force by Core Design is a pretty typical brawler that takes place in a non-descript city and various other areas. It was under development as another Streets of Rage title that Sony wanted to be exclusive for the Saturn but Core's unwillingness to follow through with the plan caused Sony to retract. The player chooses between four different fighters and also gets some choice as to which areas to visit on their way to the final encounter with madman Dr. Dex Zeng. Some of you might know this game. On the PlayStation, that being. Maybe the N64. Apparently there was a PC version as well, and I somehow managed to get it running and record it (nightmare to do so). So here it is. but it's hard/annoying to keep switching strats all the time from PSX ones to PC and back. Hell, even the PSX versions have different strats. Not even talking about N64/PSX PAL. Routing is however, still mostly the same. Mall, Naval Base. Even in the levels. You can always make some little tweaks, like getting yourself "hit" by the car in the first level to get enemies bunched and get a triple-kill (I got double this time I think), or picking bottles in Mall, but it's always up to whatever you choose mid-run. Or how the AI behaves. I am happy with the run, just because I wanted to get as most runs (NTSC-J, NTSC and PC) as possible before my last school year. And this one's unique. Not even that bad of a time tbh. Looking for competetion, if you like the game, pick it up and play it/speedrun it, you will have fun and it's not hard, especially on the lowest (this) difficulty.